OKANAGAN LAKE BC PRIVATE SANDY BEACH INCLUDES FIREWOOD AND MARSHMALLOW STICKS. 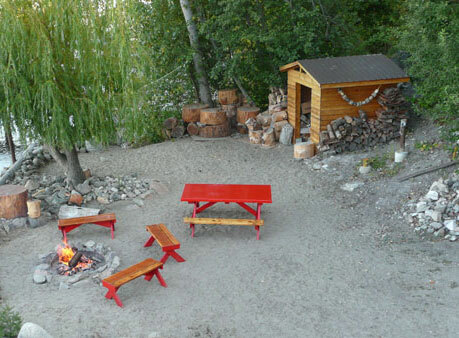 This is the ultimate Okanagan outdoor experience with a private firepit where you can curl up around the fire on those long summer evenings, roast marshmallows (sticks provided), strum your guitar, or gaze into the fire under a canopy of stars. Lucky star gazers sometime witness the stunning Aurora Borealis, a real treat for your summertime memories. Imagine swimming steps away from your own private sandy area where the water is crystal clear and the only boats coming near shore would be your own. From the shore you can either swim out to the dock and climb up the ladder to jump off the diving board, or you can simply walk out to the dock. Relax with your waterfront view while you picnic either on the wharf or on the beach. Curl up with a novel under the shade of the old willow, or stretch your towel under the sun on the sand. With or without a boat, this is the perfect spot for rest and relaxation for beach and boat lovers who want to soak up the Okanagan sunshine!